The 15th-ranked Lady Cougar basketball opened up postseason play with a 67-49 victory over Park (Mo.) University tonight in the quarterfinal round of the American Midwest Conference (AMC) tournament. Columbia, the tournament’s top overall seed, improves to 25-6 with their third win over the Pirates this season. The Lady Cougars closed the first half on an 11-2 run to take a 30-20 lead at the halftime break despite shooting just 39 percent from the field in the opening frame. The Columbia defense limited Park to 24 percent shooting (7 for 29) and pressured the Pirates into nine turnovers in the first 20 minutes. Junior Heather English led the Lady Cougars at the break with 10 points. Columbia would take control of the contest to open up the second period, using a 15-3 spurt to grab a 22-point lead at the 13:23 mark. The Lady Cougars were able to cruise to their third straight victory from there, leading by as much as 28 over the final 20 minutes. Columbia shot 42 percent from the field for the game, while holding Park to 29 percent from the floor and also owning a 40-37 advantage on the glass. English finished with 13 points on the night to lead the Lady Cougars and Aqua Corpening added 10 points off the bench as well. 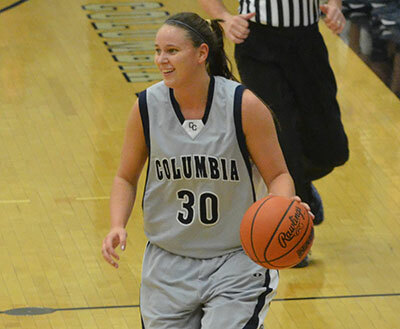 Sophomore Tierney Seifert dished out a game-high six assists for Columbia. Joanna Matthews had 12 points to lead the Pirates. Prior to tonight’s game the AMC recognized members of the 2012-13 American Midwest Conference Academic All-Conference team. To qualify as a member of the AMC Academic All-Conference Team, a student-athlete must carry a cumulative grade-point average of 3.0 on a 4.0 scale, and must have been a member of the program for the entire year. Members from the Lady Cougars include; Liliana Almeida, Mackenzie Greis, Corri Hamilton, Danielle Ingrum, Julie Teeple, Tierney Seifert, Kayla Washington, Kaitlin Allphin and Jasmine Davis. The Lady Cougars will be back in action on Friday, March 1st when they host No. 4 seed Williams Baptist (Ark.) College in the tournament semifinal round. The Lady Eagles defeated fifth-seeded Hannibal-LaGrange (Mo.) University 59-54 on Wednesday night. Columbia went 2-0 against Williams Baptist during the regular season, including a 59-55 home victory back on January 31st. Tip-off is scheduled for 7:00 p.m. at the Arena of Southwell Complex.